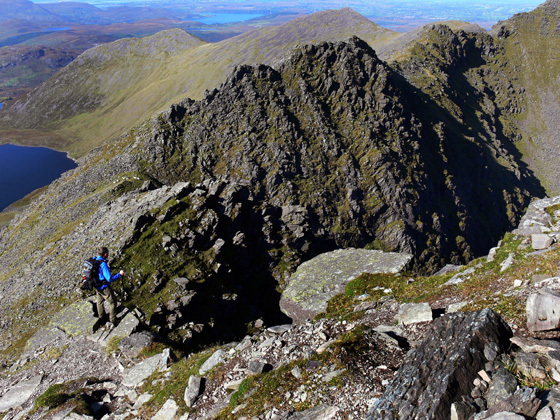 A rocky arete between Carrauntoohil and Beenkeeragh. Previously Carrauntoohil Tooth in MV and then The Bones. Changed to have main name Na Cnámha in consultation with Kerry Mountain Rescue (Gerry Christie) and OSi to avoid confusion with The Bone a spur NE of Cnoc na Toinne Na Cnámha is the 8th highest place in Ireland. Picture from group : On route to The Bones (centre), from Carrauntoohil. Picture: On route to The Bones (centre), from Carrauntoohil. A fine, high, rocky perch.